Be the first to share your favorite memory, photo or story of Nannette. This memorial page is dedicated for family, friends and future generations to celebrate the life of their loved one. 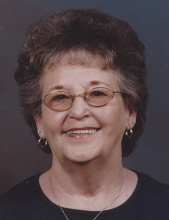 Nannette Roberson Denton, 82 of Pine Drive, Polkville passed away, Thursday, April 4, 2019 at Carolinas Medical Center in Charlotte. Born April 7, 1936 in Cleveland County, she was a daughter of the late Lester Roberson and Mary Davis Carpenter. She was retired from PPG and was a member of Clover Hill United Methodist Church. In addition to her parents, she was preceded in death by her stepfather, Fred Carpenter; a granddaughter, Sharon Branch; a brother, Salinger Carpenter and two sisters, LeFern Ridings and Debbie Mullinax. Survivors include a son, Christopher Ray Denton of Clayton; three daughters, Delores Ann Carter of Clayton, Pamela D. Branch and husband, Michael of Polkville and Robin Lee of Polkville; a sister, Fincher Bolton of Shelby; four grandchildren, Travis Lee and wife, Mindy of Fallston, Debra "Cricket" Carter of Clayton, Brian Branch and wife, Rhonda of Polkville and Christy Canupp and husband, Jeff of York; nine great-grandchildren, Taylor Williams, Russ Branch, Mckinley and Madelyn Lee, Aaron Moss, Christine Ziner, Phillip Ziner, Faith Ziner and Carter Canupp and one great-great grandchild, Kohen Lovelace. Visitation will be 1:00 PM to 2:00 PM, Saturday at Stamey-Tysinger Funeral Home. A funeral service will be 2:00 PM, Saturday at Stamey-Tysinger Funeral Home Chapel with Rev. John Ware officiating. Burial will follow in Cleveland Memorial Park, Boiling Springs. To send flowers or a remembrance gift to the family of Nannette Roberson Denton, please visit our Tribute Store. "Email Address" would like to share the life celebration of Nannette Roberson Denton. Click on the "link" to go to share a favorite memory or leave a condolence message for the family.